Do you love the fall season in Sanford, with its beautiful fall leaves bursting with reds, yellows, and oranges, but absolutely dread when the trees decide to shed their leaves? Leaf cleanup can be a hassle in your already busy schedule, and who wants to “adult” and do chores on the weekend? Wouldn’t you rather be playing and enjoying time in other ways? Well at Green Garden Landscaping, we will gladly take leaf cleanup off your plate! 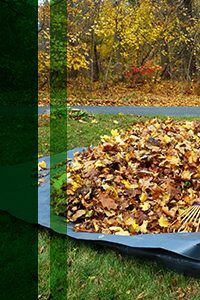 Leaf removal is important because, though the leaves will at some point decompose, removing a majority of the leaves will preserve your grass and you’ll be able to avoid having to reseed dead grass patches in the spring resulting from snow mold. Allowing your lawn to breathe in the winter — instead of being buried under a thicket of heavy, damp leaves — will prevent pests and disease, and let the air flow, bringing health right down to the roots of your grass. Leaf removal is not only essential from an aesthetic perspective, but also for agronomic reasons. Although turfgrass growth slows or ceases during this time of year, the plant will continue to photosynthesize (create nutrients/energy). This energy is stored to be used the following year. When leaves are left on Fescue grass, this reduces the ability to photosynthesize by shading available light. Leaf removal is most important with newly seeded lawns since the young grass will die without light more quickly than the established turf. Leaves that remain on fescue seedlings can also increase rot conditions by creating a dark, damp climate that will smother out weaker plants. Leaf removal should be done on a regular basis (every 7 to 10 days) as opposed to waiting until all the leaves have fallen and collecting them all at once. While young grass is still around, you’re better off using a blower to remove leaves, since a rake can injure the young grass or remove seedlings from the soil. The collected leaves can be composted to make good organic matter for gardening, or they can be used as a mulch layer in natural areas.